Chhagar Rohnit Singh, a student of M.E. Mechanical Engineering, BITS Pilani, has won the prestigious “YES Future Ready Scholarship” that is awarded to students of top B-schools and engineering Institutes. YES Future Ready is a scholarship program for empowering future business leaders in their quest to be ‘future ready’ for a digital world with emerging technologies such as AI, Cognitive Analytics, Block-chain and IoT at its core. The initiative to award scholarships seeks to identify 30 exemplary student scholars from over 20 select business and engineering campusesto nurture Design-Thinking, Innovation, Creativity-led Entrepreneurship mindsets by way of providing a scholarship of₹2, 00,000 to each student winner. Now in its 4th edition, YES Future Ready Scholarship Program (formerly known as YES Aspire) presents first-year students the opportunity to truly differentiate themselves on the basis of accelerated knowledge, experience and mentor-ship to chart their career road-map for the future. Each of the 30 students has received a YES Future Ready trophy along with the monetary award. 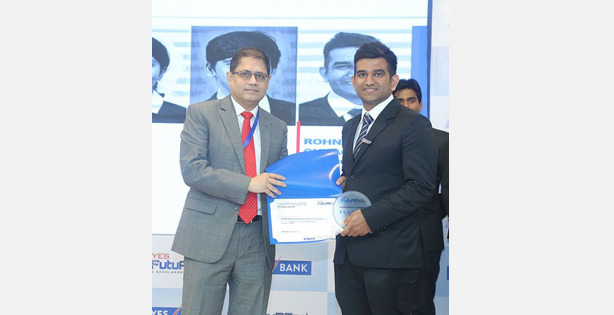 In addition to the scholarship, the candidates will also eligible to get a year-long mentor-ship from YES Bank’s top management, Pre-placement interview offers, access to ‘’Future Ready’ courses on Course-era and an opportunity to work on emerging-tech based live projects in collaboration with the bank. The felicitation program to award the scholarships took place in Indian School of Design & Innovation (ISDI Ace), 7th Floor, One India-bulls Center, Lower Parel, Mumbai in the last week of March 2018.